Despite the growth of mobile coupons, the vast majority of them are still printed. And that’s where the biggest offers are. So instead of trying to displace coupons completely, SnipSnap a new Philadephia start-up is giving people a way to take a picture of a printed coupon with an iPhone app (s aapl) and display it a check-out. The app, which launched last month, allows people to scan coupons they find in a mailer or newspaper. It reformats the information in the app and makes it easy for people to present the barcode at the point of sale for redemption. Users can get set alerts to warn them before a coupon is about to expire or remind them when they enter a store where they’ve saved a coupon. The app also offers the ability to share coupons online through Facebook(s FB), Twitter and email. 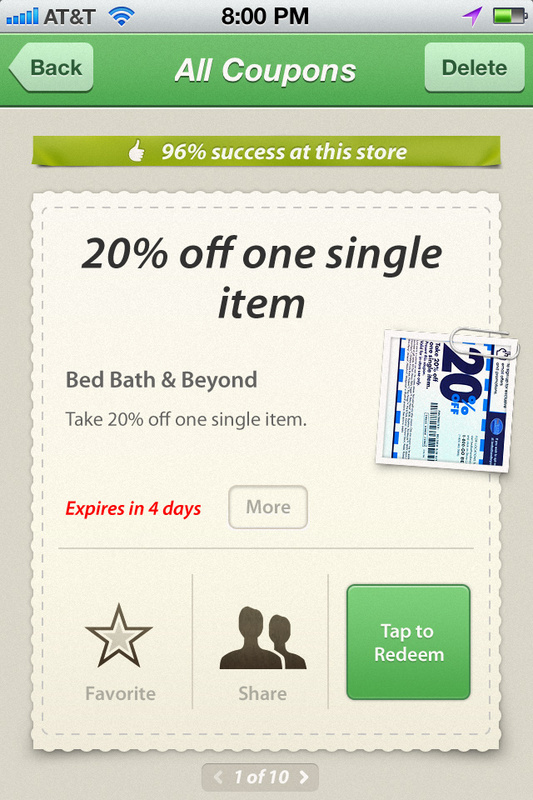 For users who don’t have coupons to scan, they can also discover other coupons snipped by fellow users. And retailers, including SnipSnaps’s first partner, Aeropostale, can also serve up coupons inside the app’s discover tab. Not every coupon can be redeemed successfully, either because the point of sale hardware can’t scan the barcode or because the store may not choose to accept it in this form. SnipSnap doesn’t work with manufacturer coupons right now, but the company is working to accept those offer coupons inside the app. SnipSnap lets users report if a coupon was accepted or not, which goes into a success score rating. Ted Mann, the founder and CEO, came up with the idea after leaving newspaper giant Gannett(s GCI), where he served as digital development director. He said he was motivated by what he called his “bowl of shame” of clipped coupons that eventually expired. Eventually, the app will become a way to distribute mobile coupons, but for the present it lets people make use of the 93 percent of coupons that are printed today. Mann’s app, which won a couple of start-up contests in Philadelphia, has seen more than 123,000 downloads and has been featured in the Apple App Store(s AAPL). The former DreamIt’s company announced Tuesday it has raised a $555,000 seed round. There are still questions about how well the service can work. Retailers may rethink how generous they are with coupons if they know that can be so easily shared. And the fact that a merchant can still reject a coupon means a consumer doesn’t have that certainty that a print coupon user has. That can be a problem if retailers start pushing back on the use of the app. But if SnipSnap can work with more retailers and eventually manufacturers, it can become a viable competitor to Coupons.com and Cellfire. Unless the store is set up to receive and process digital coupons, the app is worthless. The vast majority of printed coupons are sent by retailers to clearinghouses for counting. If a digital version of the coupon exists and the store can process, what good is taking a pic? The irony! That was part of the name I suggested for what The Point was to becomeâ€¦ SnipSnapSave.